We had a wonderful 3 nights in Wales, with delicious food and plenty of beers. 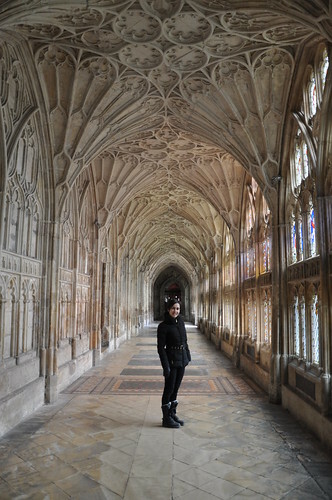 It was time to go home, but we had one more sight to see – Gloucester Cathedral. This cathedral is stunning and very Gothic. It’s pretty amazing. 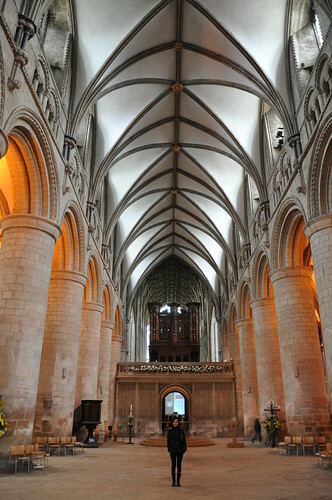 Originally a Saxon abbey, a Norman church was built on top by a group by Benedictine monk in the 12th century. 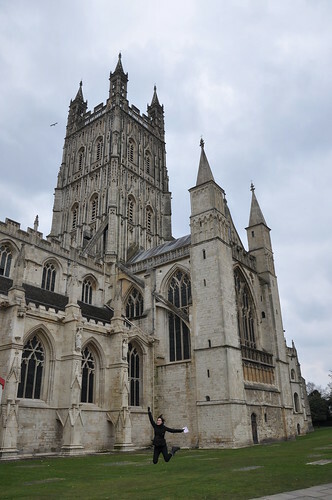 Then, when Edward II was murdered in 1327, the church was chosen as his burial place, making the cathedral a centre for pilgrimage. 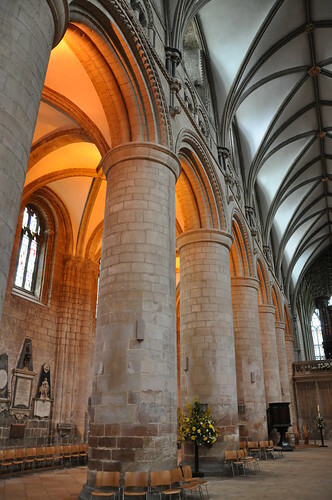 Inside, the cathedral combines the best of Norman and Gothic design with sturdy columns and Norman arches along the top. A huge space! But the cathedral’s greatest treasures, as far as we are concerned, is the Great Cloister. 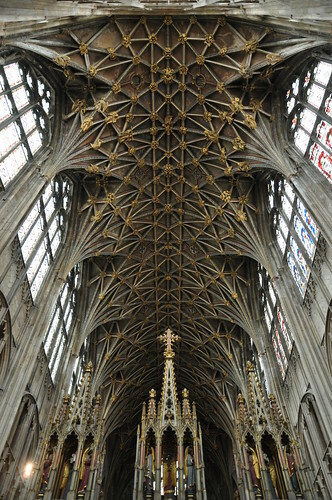 Completed in 1367, it’s apparently the first example of fan vaulting in England. Beautiful! Despite how amazing the cathedral is, we weren’t just there for the stunning architecture. This was another Harry Potter sight for various Harry Potter scenes. 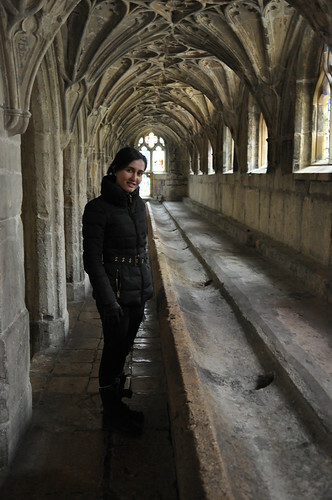 These cloisters are so striking, I’m not surprised that they were used in 3 of the movies! 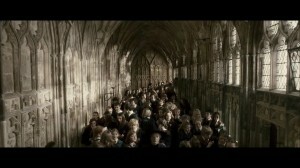 The dramatic corridor above was used in Harry Potter and the Half Blood Prince where Harry and Ron are watching the firsties walking to class. 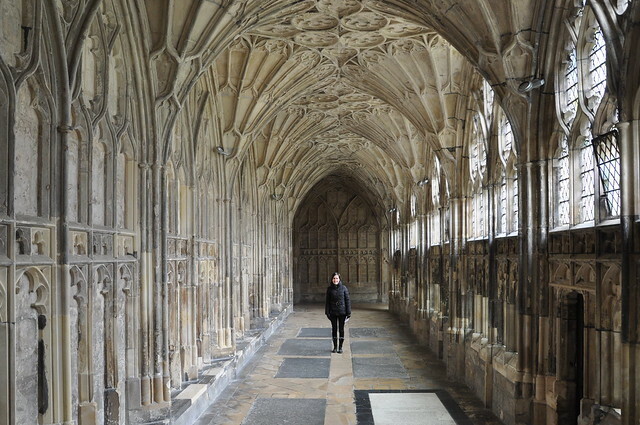 Chris Columbus (director of the first 2 Harry Potter films) must have loved Gloucester Cathedral because he used it in various scenes, like when the troll wanders through the corridors in the first film. A doorway was used as the Griffindor common room entrance in the Philosopher’s Stone film. 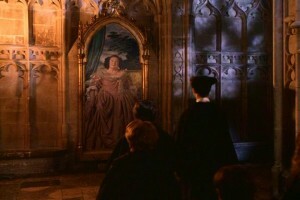 Several scenes in Harry Potter and the Chamber of Secrets were filmed here, such as when the heir of slytherin left blood writing was on walls. They had slightly more dramatic lighting than our daytime view here! 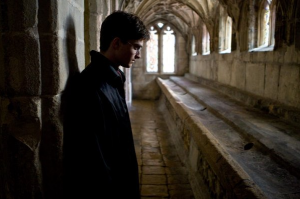 Finally, in Half Blood Prince again, Harry overhears a secret conversation between Draco and Snape while hiding in this alcove. 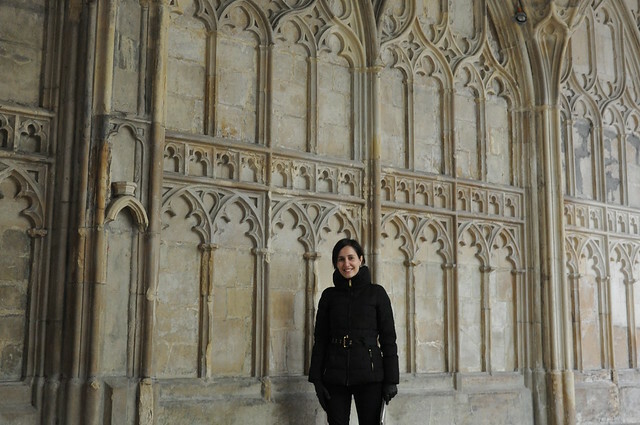 Draco and Snape were in the cloisters for their conversation too. Success! 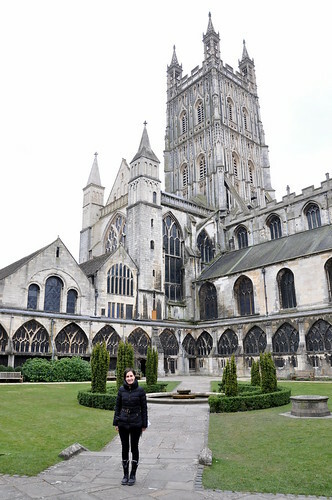 Gloucester Cathedral is a stunning place to visit, so if you find yourself in the area, I recommend you go. We had a great long weekend driving through England and exploring South Wales. We still have to check out Cardiff sometime, but otherwise our Welsh explorations are done for now.